All of our organza gift bags are stocked in our warehouse. Originally made from silk, the organza material is a favourite amongst designers and event planners alike because of its durability and adaptability. The fibre is delicate and is most commonly used to make bridal dresses and formal clothing. The translucent material has a firm yet soft touch that makes it easy to alter and style accordingly. 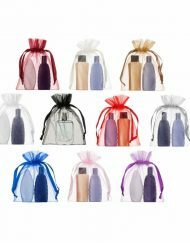 Why Choose Our Organza gift bags? Ideal for a child’s birthday party, wedding or tradeshow, these pretty fairy pouches are cute and fun. They’re the perfect size for holding chocolate or sweets to give as a gift or favour. Alternatively the pouches can be used to hold a piece of jewellery for a close friend or family member. 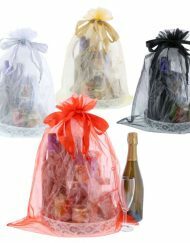 Whatever the event, these small organza fairy bags add a sweet touch to your special occasion. Customers can purchase their organzagift bags bags in shades of silver, black, white and many other colours. These colours can be equally suitable for elegant, formal or fun events. Why not incorporate an organza pouches bag into your dinner party or baby shower? With our organza pouches, the possibilities are endless. All you have to do is choose what to put in them. The semi-transparency of the material allows for the guests to get an exciting sneak peek at their gift. 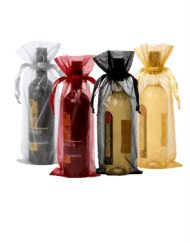 How Can My Business Benefit From Organza Drawstring bags? 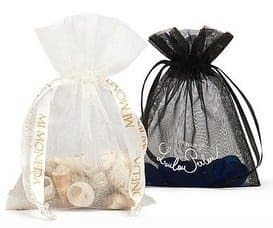 This style of organza drawstring bags is very popular with small jewellery businesses that understand that good packaging is an essential part of a good marketing strategy. These bags work well on the shop floor, as they attract the eyes of the customer and engage their curiosity. 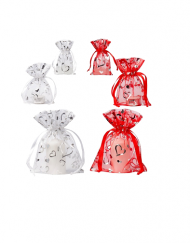 What Are The Features Of The Organza drawstring bags? 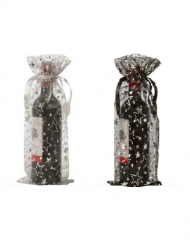 The Organza gift bags are available in various colours: black, silver and white. Our small organza bags are a translucent material. The detailed metallic silver hem lining at the opening of the pouch is made from lurex yarn. The material is medium to firm to touch. The high-quality satin ribbon is 4 mm wide and ties at the top of the pouch in order to create the desired attractive shape. Standard packaging is 100 units per carton. The organza gift bags are available with free, package tracked shipping in three days. If you are not fully satisfied with your order, we have a 14-day return policy. 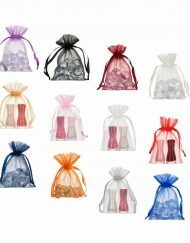 The organza pouch fairy bags are available wholesale in the UK and across Europe. Purchase in bulk for our special bulk discount price. – Lurex yarn in the metallic silver color at the top of the pouch. – Durable, high-quality satin ribbon with width of 4mm.